Boaters often pay little attention to a boat’s steering system, as long as it takes the boat in the desired direction. Simply stated, a boat’s steering system determines the boat’s course when the steering wheel is turned and, like most other systems on a boat, needs regular inspection, maintenance and cleaning during the boating season. 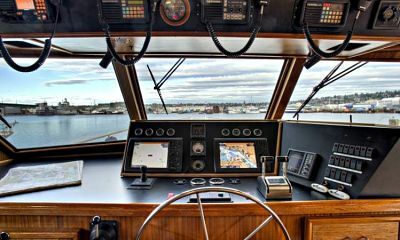 A boat’s steering wheel is part of the helm that connects to a mechanical, electric, or hydraulic system to assist in turning the boat. Boats with outboard motors steer with a wheel which rotates the entire drive unit; inboards sometimes use a pod with an attached propeller; personal watercraft use jet drives with an impeller to force water into a nozzle that the operator can turn to the desired course. Some modern ships replace the wheel with a toggle that remotely controls an electric or hydraulic rudder drive, with an indicator that shows the rudder angle in real time to the helmsman. Regardless of the steering system used on a boat you might consider as a one-day rental or an extended charter, it is a good idea to learn what kind of system the boat uses, to understand how it works, the location of system components, and to be able to make simple repairs if the steering leads you astray while underway. Steering systems consist of a wheel, helm, steering cable, and cable connections, all linking the wheel to the engine. The most important component is the helm, which converts a wheel’s rotary motion into a push-pull motion on the cable, ultimately moving the propeller right, left, or to amidships. Most helms are of the rotary type, using gears to turn the rudder, described below. Reduction gear: One or two gears that mesh with the steering drum to move the steering cable. These helms require a large round assembly behind the dash, so they often will not fit into smaller, crowded dashboards (the cluster of dials and gauges, either analog or digital, that are located behind or adjacent to the steering wheel. They provide a snapshot view to the operator of engine speed and performance, trim tab location, fuel usage, and related information). Planetary gear: Three or more gears that mesh with a drum to move the cable. This design takes up less space, so it’s good for boats with small dashboards. This type has many wear points and more wheel play than reduction gear helms. Another helm type is the rack and pinion, which uses a gear fitted directly onto the steering shaft and engages a rack gear in a tube-like housing, greatly improving helm efficiency. The primary difference between a rack, pinion and a rotary helm is how the equipment fits behind the mounting surface. Regularly inspect the steering cable and connections. Periodically clean and lubricate grease cable fittings and supports. Use a marine grade, lithium-based grease. When storing a boat for extended periods, remove the steering cable connection to the engine and thoroughly clean and lubricate. A steering cable of proper length and without excessive or tight bends provides the operator with effortless handling at all speeds, increases system efficiency, and reduces excess wheel and cable play. If steering becomes hard or inconsistent, cuts holes, or if corrosion appears on the cable surface, immediate replacement is the best course. A relatively new technology has been developed to eliminate engine torque feedback at the helm. With traditional steering systems, the engine pushes the boat to the right, requiring the operator to compensate by keeping wheel pressure to the left. No Feed Back (NFB) equipment, affixed to the steering system at the helm, isolates the engine’s torque with a built-in clutch that keeps the boat on course without constant correction. Basically, the NFB clutch isolates engine torque, significantly reducing operator fatigue and course errors. The significant torque generated by engines creates a load on the steering system that must be continually controlled by the operator, even when the boat is headed straight. If the operator becomes fatigued, incapacitated, or releases the wheel while underway, the abrupt change of direction creates a very dangerous situation. No Feed Back systems, described above, are designed to reduce helm fatigue and to make boating much safer. Ever wonder why helm stations are on the right (starboard) side of a boat? The reason has everything to do with hydrodynamics, weight distribution, and engine torque. Propellers on boats with single screw engines turn in a clockwise (left) direction, which inherently push the vessel to the right (starboard) side. To counteract this to-the-right motion (called propeller walk), boat designers positioned the helm station on the right and at roughly an amidships location so that operator and helm equipment weight would make the starboard side heavier, offsetting the movement to the right to a degree. In the days of wooden ships and canvas sails, sailors manning the helm etched grooves into a spoke of the ship’s wheel perpendicular to the deck (called the king spoke) when the rudder was straight. The grooves served a very practical purpose: at night or when continuously maneuvering, the helmsman could quickly determine that the rudder was amidships simply by feeling for the grooves on the king spoke. Throughout centuries of waterborne transportation, the tradition of marking a boat’s steering wheel to indicate an amidships rudder has continued. Mariners developed an intricate, decorative knot, called a Turks head, which tied around the king spoke, and used in the same way as spoke grooves, to indicate an amidships rudder. Though the Turks head is still found on boat wheels today, a steel turning knob is more common, positioned in the same place as the king spoke grooves or Turks heads. In addition to indicating that the rudder is amidships, the turning knob provides considerable mechanical advantage when turning a steering wheel. Though mostly out of sight on a boat, a well-maintained steering system provides the means for effortless and responsive maneuvering and a way to safely get out of harm’s way and onto a great day on the water.